A Florida high school student-turned-activist who survived one of the deadliest school shootings in U.S. history is headed to Harvard. David Hogg, who took a year off after graduating Marjory Stoneman Douglas High School in June 2018, said on Twitter Saturday that he'll "be attending Harvard in the fall with a planned major in Political Science." Since the Feb. 14 massacre at Stoneman Douglas that left 14 students and three faculty members dead, Hogg has been one of the most visible activists in the gun control movement and the March for Our Lives campaign launched by him and other classmates. Hogg and other survivors have been vocal advocates for gun reform, making countless media appearances and grilling lawmakers during town halls. Their efforts sparked massive walkouts and peaceful protests at schools across the country and also drew international attention. Hogg and other students were in South Africa in November and were awarded the International Children's Peace Prize for their work with March for Our Lives. Demonstrations were held across the U.S. to protest gun violence after 17 people were killed in a Florida high school. The group organized a demonstration in Washington in March, with hundreds of thousands of people filling the streets of the nation's capital. Satellite demonstrations were also held across the country on the same day. March for Our Lives then hit the road over the summer, visiting 80 communities in 24 states to help register young voters and spread its message against gun violence. Hogg has made several visits to Massachusetts as part of his efforts. In August, he attended the kick-off for the March for Our Lives 50 Miles More walk against gun violence. In September, Hogg, along with other youth activists, made an appearance at Harvard to talk about engaging young voters. Hogg also returned to Boston in October for a public discussion about civic activism and gun control at the Boston Public Library. 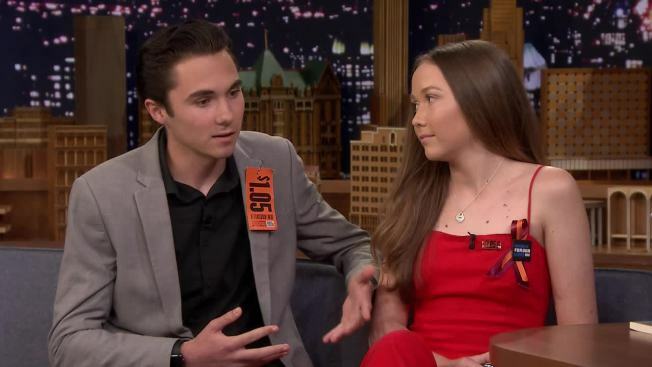 Hogg co-authored a book, "#NeverAgain: A New Generation Draws the Line," with his younger sister Lauren. The book offers an inside look at the early days of the grassroots effort that made Hogg and other Parkland shooting survivors household names. Hogg writes that the March for Our Lives group came "together to try to heal the world and found out that was the best way to heal."